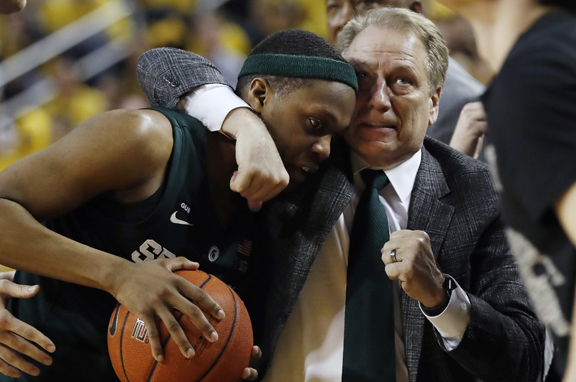 EAST LANSING — Cassius Winston is a reflection of his parents and Michigan State is reaping the benefits. He is driven for success like his mother, Wendi. He aims for accomplishments on annual lists — including being an All-America player and making it to the Final Four this year — and his mother holds him accountable. “She has always made me write down my goals and chase them,” Winston said. Winston is the only Division I player, as of Wednesday, averaging at least 19 points and seven assists while connecting on 40-plus percent of 3-point attempts. And, he’s coming off perhaps his best performance. He scored 27 points and had eight assists to lead Michigan State to a 77-70 win over rival Michigan on the road. Winston was named the Big Ten player of the week after averaging 27.5 points, eight assists and 3.5 rebounds while making half of his 3-point shots in wins over then-No. 7 Michigan and Rutgers. He has joined three players in conference history to earn the honor at least five times in a season, putting him in an elite class with Purdue’s Glenn Robinson and Caleb Swanigan along with Ohio State’s Evan Turner. in a career: 2016 national player of the year Denzel Valentine, 2000 national champion Mateen Cleaves and 1986 Big Ten player of the year Scott Skiles.